Stalking has been known to psychologists as one of the most uncomfortable experiences that an individual can be exposed to, especially when he/she is living in unfamiliar places. 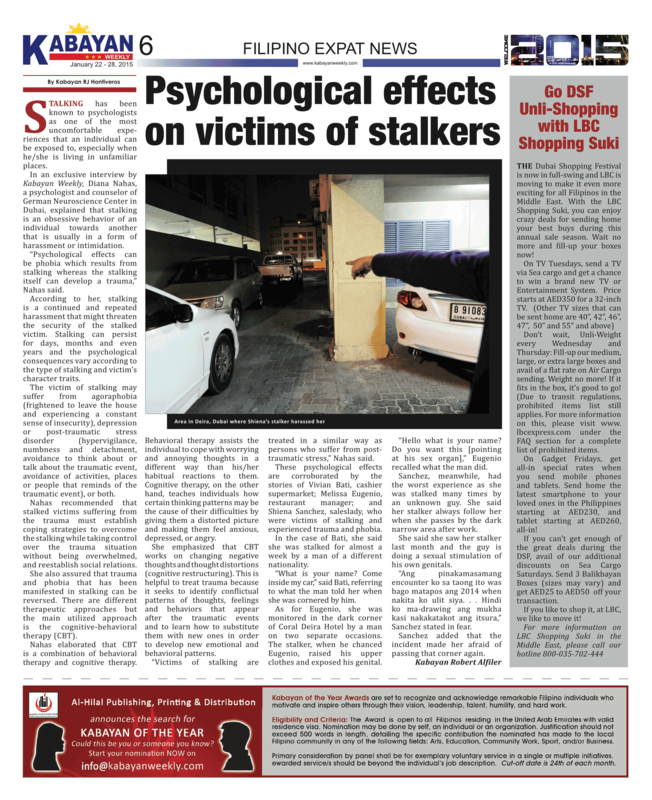 In an exclusive interview by Kabayan Weekly, Diana Nahas, a psychologist and counselor of German Neuroscience Center in Dubai, explained that stalking is an obsessive behavior of an individual towards another that is usually in a form of harassment or intimidation. “Psychological effects can be phobia which results from stalking whereas the stalking itself can develop a trauma,” Nahas said. According to her, stalking is a continued and repeated harassment that might threaten the security of the stalked victim. Stalking can persist for days, months and even years and the psychological consequences vary according to the type of stalking and victim’s character traits. The victim of stalking may suffer from agoraphobia (frightened to leave the house and experiencing a constant sense of insecurity), depression or post-traumatic stress disorder (hypervigilance, numbness and detachment, avoidance to think about or talk about the traumatic event, avoidance of activities, places or people that reminds of the traumatic event), or both. Nahas recommended that stalked victims suffering from the trauma must establish coping strategies to overcome the stalking while taking control over the trauma situation without being overwhelmed, and reestablish social relations. She also assured that trauma and phobia that has been manifested in stalking can be reversed. There are different therapeutic approaches but the main utilized approach is the cognitive-behavioral therapy (CBT). Counsellor Nahas elaborated that CBT is a combination of behavioral therapy and cognitive therapy. Behavioral therapy assists the individual to cope with worrying and annoying thoughts in a different way than his/her habitual reactions to them. 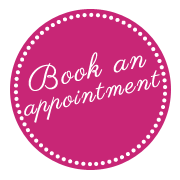 Cognitive therapy, on the other hand, teaches individuals how certain thinking patterns may be the cause of their difficulties by giving them a distorted picture and making them feel anxious, depressed, or angry. She emphasized that CBT works on changing negative thoughts and thought distortions (cognitive restructuring). This is helpful to treat trauma because it seeks to identify conflictual patterns of thoughts, feelings and behaviors that appear after the traumatic events and to learn how to substitute them with new ones in order to develop new emotional and behavioral patterns. “Victims of stalking are treated in a similar way as persons who suffer from post­ traumatic stress,” Nahas said. These psychological effects are corroborated by the stories of Vivian Bati, cashier supermarket; Melissa Eugenio, restaurant manager; and Shiena Sanchez, saleslady, who were victims of stalking and experienced trauma and phobia. In the case of Bati, she said she was stalked for almost a week by a man of a different nationality.